Harlee, Wozniak and the rest of the crew faced the possibly deadly consequences for breaking the blue wall on Shades of Blue Season 3 Episode 6. It's still unclear who will survive the reckoning. Harlee was foolish to leave Nava's notebook in Bennet's apartment with Cole and walk away. Getting that warrant sent an automatic red flag to Ramsay who must have had the apartment swept before anyone else ever got there...or just ordered Cole to do the deed himself. I still don't trust Cole. 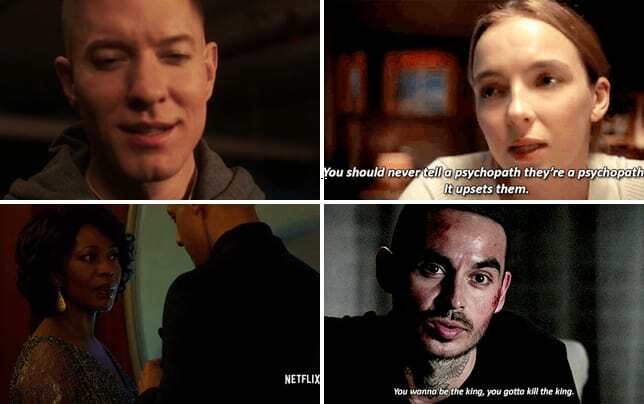 He's trying to straddle two worlds as he feeds Harlee enough information to make him feel like he's doing something yet continues to do Ramsay's dirty work. It's a 50/50 shot at best that he'll have Harlee's back if she needs him. At least we can assume he sent her that text so she and Loman didn't get their heads blown off. But did Cole set Harlee up in the first place or did those detectives realize that Harlee knew about Magnolia? At least Bennet was stilling sitting in lockup, but perhaps not for much longer. After spending months trying to take down Harlee and Wozniak, it was an incredible irony that he might be their only ally in trying to prove the Intelligence Unit is in bed with the cartel. There was even strife within the crew itself as Espada lamented that they all should have been informed before Harlee and Woz took the drastic step of arresting Bennet. Tess: Jumping out a window. That seems like a fitting end to the end of my tenure with this crew. Tufo: You're gonna ride off into the sunset, Tess. Tess: Are you kidding me? I have lost my marriage, I have been shot, then operated on by Espada Nightingale. I have been lied to, demoted, aced out of a payday, and then, oh, I was called out on my first date in forever to torture a hit woman in a shower. Taking a concrete plunge seems like the only logical next step for me, Tufo. Tufo: Let's work on our whole glass have full thing, yeah? Permalink: Let's work on our whole glass have full thing, yeah? And yet she risked her life for her crew, being the lone officer to come to their rescue, not that we can be sure that even Tess can rescue them now. As soon as someone asked dispatch for the call sign of the officers involved in the shooting, I knew what was about to happen, and I never doubted that Tess would pull her gun on her reluctant partner in order to get there to help. Tess doesn't take no for an answer. Harlee has been determined to do the right thing throughout Shades of Blue Season 3 but how much will it cost her and her team? When Wozniak and Ramsay met at the bar, it reminded me a lot of the scene from the movie "Heat" where Robert Dinero and Al Pacino's characters, a criminal and a police lieutenant meet on neutral ground for a chat and seem to have more in common than either would like to admit. The oddity here is that Wozniak and Ramsay are both the police and the criminals. Wozniak had no problem admitting to killing Saperstein because he knew that Ramsay was in no position to judge as he'd recently ordered one of his own men killed. Woz even felt as though he held the high ground because he had the guts to do the job himself. As Woz said, a hero is just a villain with a backstory, and in some strange way, I think Woz views himself as a tarnished hero. Woz would have made the deal with Ramsay to let Bennet be the sacrificial lamb for the entire Intelligence Unit, but would Harlee have been happy with that? It would mean justice for Nava's murder but I'm not sure that Harlee can turn a blind eye to the blatant corruption any longer. At least Harlee knows the Intelligence Unit is a problem but she has no idea that Stahl is setting her up for murder. Agent Myers: Detective Santos, this isn't a good time. Harlee: My apologies. When would be the most convenient time for my psychotic stalker to show up again? Agent Myers: Ideally when someone else is around to see him. Permalink: Ideally when someone else is around to see him. I'm still a little confused as to why the FBI was so willing to believe Gina over Harlee after just one phone call. You'd think they'd at least want to speak to her face to face. At first, I assumed that Stahl had killed Gina, and he very well may have, but that bloody knife could also be from the hitman he killed on the street. Although setting Harlee up for Gina's murder makes more sense as he was obviously waiting for her to make her way back to Gina's apartment. But Harlee has to survive her current predicament and the odds of everyone making it out of that warehouse alive are slim. Even before the shooting began, I was worried about Woz. It looked as though he was holding his arm earlier, as though he was in pain. Were his visions of Annie the sign of a mental breakdown, or a physical one? Check back next week for my review of Shades of Blue Season 3 Episode 7 and until then, you can watch Shades of Blue online here at TV Fanatic.